Are you investing some of your marketing budget in a trade show? 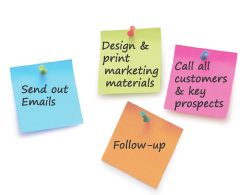 Need support with the preparation involved in letting prospects & customers know you will be there? Momentum Partnership will help you make an impact, before, during and following the show. Trade shows and events can be a fantastic way of coming face to face with your audience, directly presenting your offering and establishing new customer accounts. A successful event will help to boost your pipeline and increase your sales potential, as well as giving you a feel for future market trends and what your competitors are up to. We will develop a support package that can contain any of the following elements depending on the level of support you require to maximise your return on investment. • Pre and post show communications strategy which can include email marketing, telemarketing, press releases and direct mail in order to reach as many people as possible to build your brand, increase traffic to your stand and enhance your potential for sales conversions. • Creative design of any literature required, both digital and print, as well as stand design. • Post event support to contact leads and prompt sales conversion.